Trying to export mailbox from O365 to PST format using Office 365 eDiscovery search? But to due to its some limitations, the migration process gets failed. Don’t worry, free try another solution i,e; Office 365 Export Tool to complete the task. Office 365 is a cloud-based application, which allows the user to access MS Office suite programs along with productivity services on the internet. In fact, O365 users can access their emails or applications from anywhere at any instant of time. Apart from this, What are the Office 365 e-mail search limitations from a discovery perspective? Why do users need to be aware of conducting litigation, internal investigations, and regulatory compliance? Therefore, in the upcoming section, we will discuss Office 365 eDiscovery search limitations in a detailed manner. 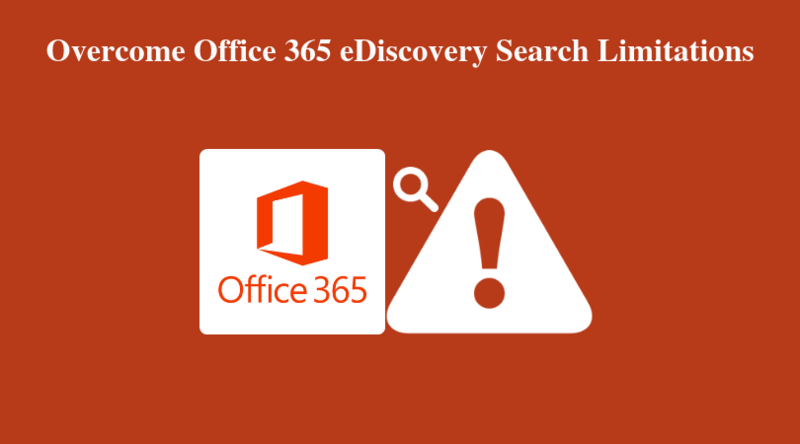 The eDiscovery search in Office 365 Compliance Center where cases can be accessed and managed. Now, the user can identify proper email and place a litigation hold on sources like SharePoint and MS Exchange. Holds can be placed depending on the dates, keyword queries, senders, authors, and email domains. When users start searching for keywords, standard Boolean (AND, NOT, OR ) and proximity operators (n) can be used, as well as wildcards expand keywords to contain terms that involve a keyword or terms that have different spellings. Optical Character Recognition (OCR): It cannot be performed by Office 365, image-based files cannot be searched (eventually if OCR is added, which is unlikely to be checked with Microsoft Support on OCR engine. Some OCR engines do not support recognition of Japanese, Chinese, and any other foreign languages). Password Protected Attachments: Unable to search password protect email attachments. Special Character Indexing: Some special characters like “, . / – ‘ _ &” found in patent cases are not indexed and can get a result in a higher number of documents in attorney review stage of eDiscovery process. While performing the Office 365 eDiscovery search process, you must have a higher technical knowledge. Therefore, there is one automated way namely Office 365 Export Tool by which users can migrate Legal hold archive mailboxes or In-place Archive emails. It has the potential to extract Office 365 items including emails, calendars, tasks, contacts, soon. It enables the user to extract only specific data instead of extracting the complete Office 365 mailboxes. Also, it offers date filtration to export O365 data within a certain date range. With this utility, users can extract data from Office 365 account in different file formats without any risk or data loss. Moreover, it has a user-friendly interface that even a novice user can use it without taking external help. First of all, launch Office 365 Export tool and click on the Login button. On the next screen, check the checkbox corresponding to Is Admin button. After that, you can enter all the credentials for same and click on Sign in button. Choose the relevant user id credentials as displayed below and press Next button. Now, select the file type (PST/ EML/ MSG) you want to export emails from Office 365. Click on Browse button to select the desired location for the software and click the Start. button. At last, the software will start the export procedure. Office 365 provides a large amount of utility with respect to litigation holds and preservation. However, the email search capabilities have multiple limitations. 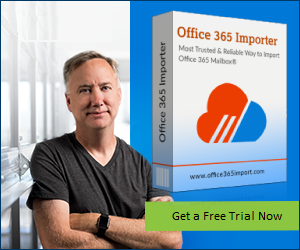 Thus, in this blog, we have discussed a reliable and instant solution named as Office 365 Export that will help to extract data from Office 365 Mailbox or Archive Mailbox to different file formats. Also, we have explained the complete working steps of the tool in a clear way. Ashish is an enthusiastic independent blogger, whose main area of interests are cloud-related technologies. His areas of interest are Microsoft Outlook, Exchange Server, Azure, Office 365 & SharePoint.